Anthony Joshua will face undefeated American Dominic Breazeale in the first defence of his IBF world heavyweight title this summer. The 30-year-old Breazeale, who competed at the 2012 Olympic Games where Joshua won his gold medal, will travel to London’s 02 Arena on June 25 for his first fight at world level. His selection as Joshua’s opponent comes after a long period of him being monitored as a potential challenger, according to the champion. The 26-year-old Briton, who is expected to also face WBO and WBA champion Tyson Fury in the next 12 months, said: “My coaches have watched Breazeale for a long time and they knew he was going to be a player in the division and now we get the chance to go war on June 25. “It’s sure to be explosive, both of us like to let our hands go and score knockouts, we are both undefeated and both have Olympic pedigree. Breazeale lost 19-8 to Russia’s Magomed Omarov in the first round at London 2012 having taken up the sport at a late age following earlier attempts to be an NFL quarterback. The 6ft 7in American has won all 17 off his professional fights so far, with his most impressive victory coming in January when he recovered from a heavy knockdown to defeat Amir Mansour, who withdrew after five rounds having suffered a fractured jaw. Breazeale’s emergence as Joshua’s opponent also demonstrates the desire of promoters Matchroom to build the IBF champion’s reputation in the potentially-lucrative US fight market. 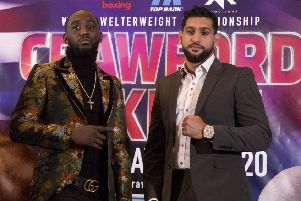 His most decorated hoped-for opponents - including Fury, David Haye and Wladimir Klitschko - remain in Europe, but American Deontay Wilder remains the WBC champion and is another expected target should Joshua continue to develop. Matchroom, incidentally, have made no secret of their plans to turn Joshua into a Pay-Per-View attraction on one of the American television networks HBO or Showtime. It has also been confirmed that British super middleweight George Groves will fight domestic rival Martin Murray on the Joshua-Breazeale undercard in an eliminator for the WBA title.